On Saturday the 21st October 2017 the Pan-African Ahmadiyya Muslim Association (PAAMA) UK held its first ever National Africa Peace Symposium in the Baitul Futuh complex, South London. 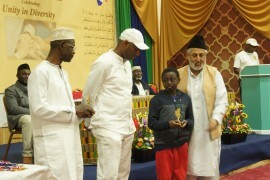 The landmark event is the first of its kind in the history of PAAMA UK and had as its theme “Unity in Diversity”. The Symposium sought to explore the unity that religion brings to our complex differences in all spheres of life be they social, political or indeed religious. 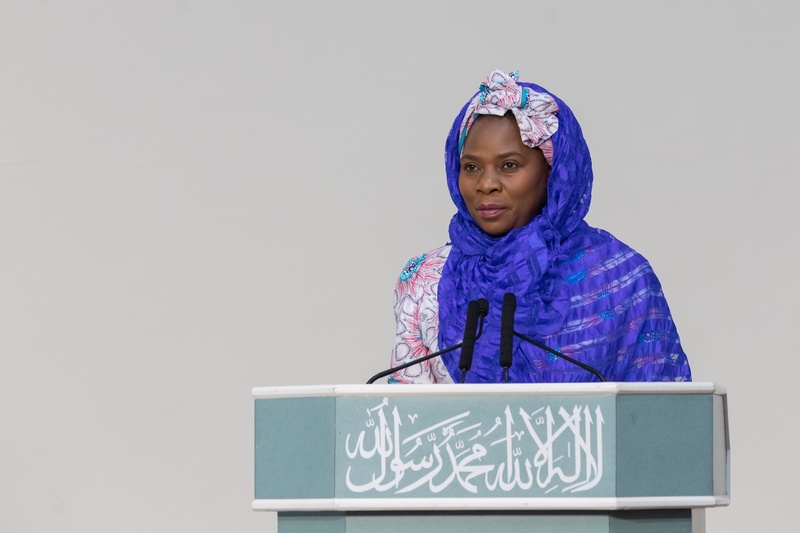 It also aimed to promote a deeper understanding of Islam and other faiths with a view to inspiring a concerted effort for lasting peace among the peoples of Africa. The event was attended by distinguished personalities from various walks of life including parliamentarians, diplomats, community and civic leaders, a 14-man delegation from Belgium and eminent members from the Ahmadiyya Muslim Community in the UK. PAAMA UK Tabligh Secretary Toban Ephram reciting verses from the Holy Quran. 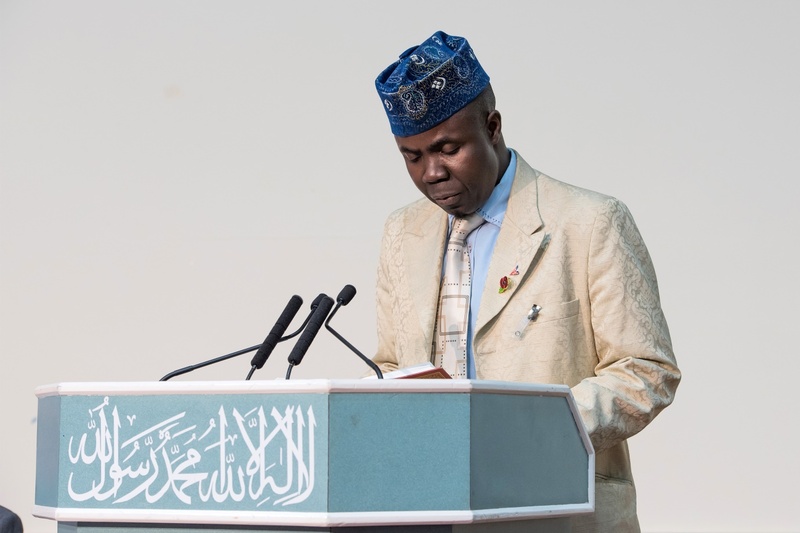 The Symposium opened with a recitation of the Holy Quran by Brother Toban Ephram and an English rendition given by Brother Misbahudeen Adewale. 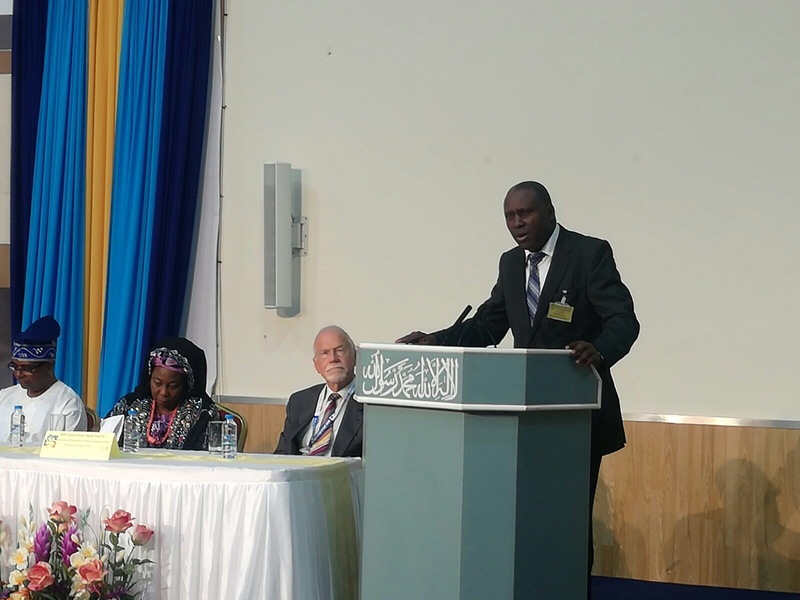 A video presentation encapsulating the services of various activities the Ahmadiyya Muslim Community undertakes in Africa through the International Association of Ahmadiyya Architects and Engineers (IAAAE) and Humanity First. Through activities such as the Water for Life programme, building schools, libraries, science laboratories, hospitals, clinics and model villages the Ahmadiyya Muslim Community helps to improve the lives of ordinary people across the continent of Africa. The next distinguished speaker to be called was H.E Julius Peter Moto, the High Commissioner for the Republic of Uganda. His Excellency expressed his appreciation and delight in gracing the event. He stated that peace is something we cannot talk about without planting good seeds politically and the African continent is overwhelmed with political refugees all over as a direct result of lack of good governance. He cited examples of countries in Africa whose populations have been displaced because of political unrest and that Uganda, which has enjoyed relative peace, has been host to over 1.2 million refugees from South Sudan. In concluding he praised the great efforts made by the Ahmadiyya Muslim Community in Uganda in building schools, hospitals, radio stations and erecting solar panels in various communities in the country. The keynote address was given by the distinguished Lord Tariq Ahmad of Wimbledon, Minister of State at the Foreign and Commonwealth office. In his speech he expressed the significance and relevance of the Commonwealth in modern times. To see communities celebrating their diversity but recognising their strength in unity is a laudable feat. Lord Ahmad went further to elaborate how the theme of the Symposium “Unity in Diversity” loudly resonates with his roles in the Foreign and Commonwealth Office. He appealed to the diverse gathering to work with him and the Commonwealth to see how we can mitigate the effects of climate change, how we can keep people safe from violent extremism, cyber- attacks, human-trafficking and modern slavery and how we can protect our shared values. He highlighted the important role that faith groups can play as important peace brokers for e.g. the role the Catholic church played in negotiating peace between the FARC guerrillas and the Colombian government and the role that faith groups play in Ghana to broker peace and maintain a peaceful co-existence between diverse communities. The next speaker was the Deputy High Commissioner of the Republic of Ghana to the United Kingdom, Mrs Rita Tani Iddi. Mrs Iddi expressed her joy in attending the event and also relayed apologies sent by His Excellency, the Ghana High Commissioner to the UK in whose capacity she is deputising. Mrs Iddi also tendered greetings to PAAMA on behalf of the government and people of Ghana. 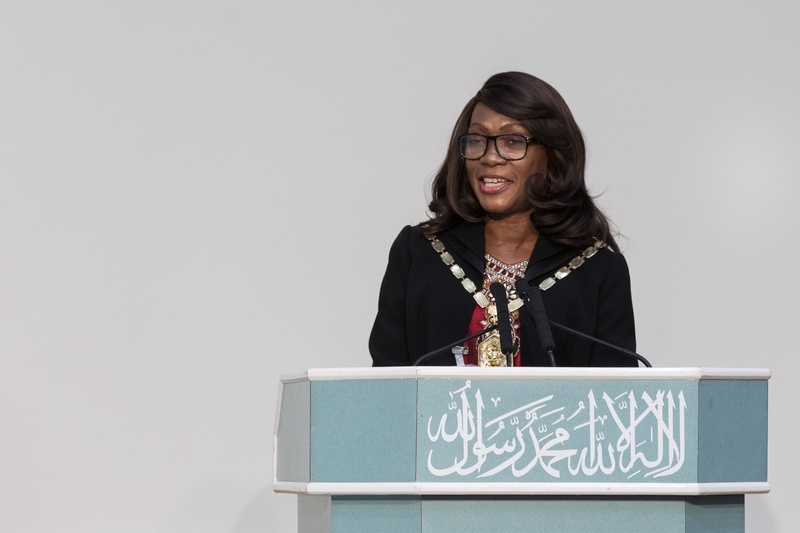 She acknowledged the good work that the Ahmadiyya Mission is doing in her country in the areas of education, health, education, provision of social amenities as well as moral and spiritual guidance in the country. 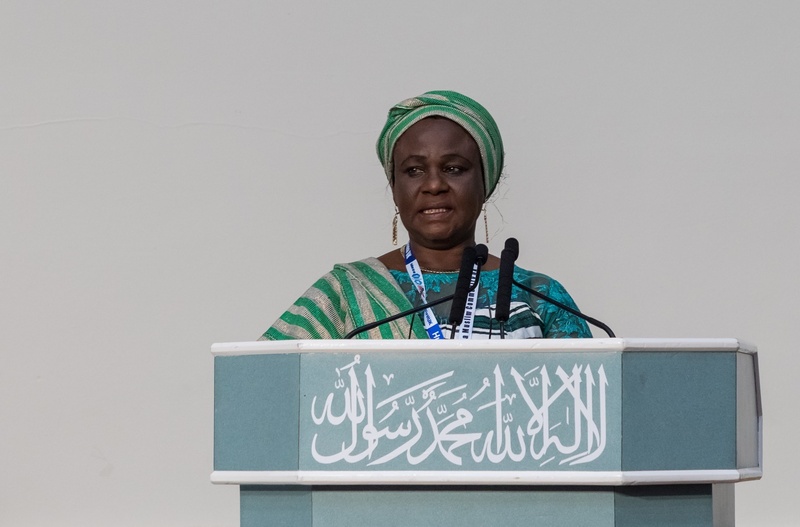 She noted that most of the mission’s projects were accomplished under the leadership and guidance of His Holiness Khalifatul Masih V. She recalled and acknowledged the various roles His Holiness played in various capacities in the development of Ghana. She related to the symposium’s theme “Unity in Diversity” in relation to life in Ghana where though the population is very diverse but they always try to get together to have dialogue and a common understanding. She concluded with a promise ensuring that the essence of the symposium’s teachings is passed on to the Ahmadiyya Muslim community in Ghana. The next guest speaker for the occasion was H.E Dr Justina Mutale, Founder and President of the Justina Mutale Foundation (a scholarship program for under-privileged young women) and African Woman of the Year 2012. Coming from a predominantly Christian community in Zambia, that’s relatively peaceful, Dr Mutale expressed her surprise at discovering the religious intolerance she is experiencing here in the West. She expressed alarm at the possibility of the human race (supposedly the most intelligent of God’s creation) on the verge of destroying itself by the push of a button. Dr Mutale referred to her traditional belief in the philosophy of “Ubuntu”; a traditional belief in Southern Africa that we are humans because of other humans. She also highlighted the worrying prospect of the US threat to exit the United Nations and the UK exiting the European Union, and yet these are institutions formed on the background of preventing world conflicts and crises. She appealed that as humans we need to go back to the golden principles of doing unto others as you will want others do unto you, and seeing that no one wins in wars. She echoed that the only hope for humanity’s survival is for peace to reign and concluded that we should go back to the principle of “Ubuntu”. A short video presentation followed chronicling the numerous trips and visits made by Huzur to various world legislative bodies including the European Parliament, the UK House of Parliament, Canadian Legislative House and the United States Congress where he takes the message of peace and Love for All Hared for None and to world leaders from the Far East to Europe, from North America to Africa discussing economic, social and political problems facing the world today. 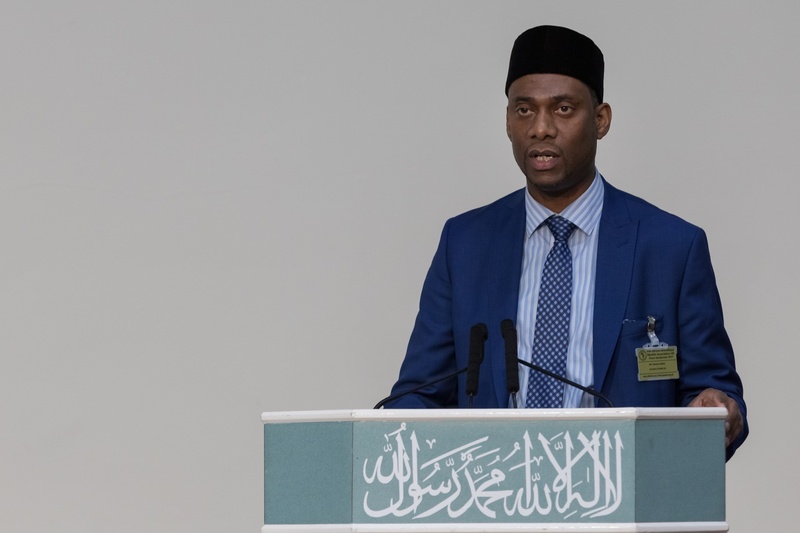 The National President of the Ahmadiyya Muslim Community in the UK, Mr Rafiq Hayat gave the Closing Remarks and delivered a message from His Holiness, Hazrat Khalifatul Masih V. Before delivering his speech he acknowledged the great work done by President Tommy Kallon and his team in organising the Symposium. 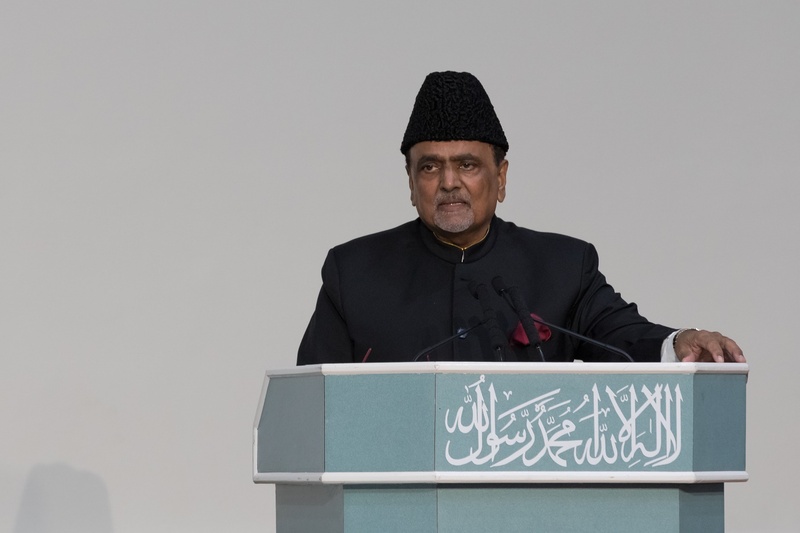 President Hayat noted that it is only faith that can bring about peace because the fundamental principles of faith are based on morality, justice and fair play. This will only be possible when faith leaders come together and bring harmony to this world as exemplified through the work done by His Holiness, Hazrat Mirza Masroor Ahmad. Mr Hayat then read a message from His Holiness addressed to all the attendees of the Symposium. In his message, Huzur prayed that Allah Almighty grants wisdom to the people of the world so that instead of moving rapidly towards destruction and catastrophe people will come to realise the need to step back from the abyss and seek to build bridges of love and peace in society. This will only be possible if nations all over the world are willing to work together for the good of mankind. 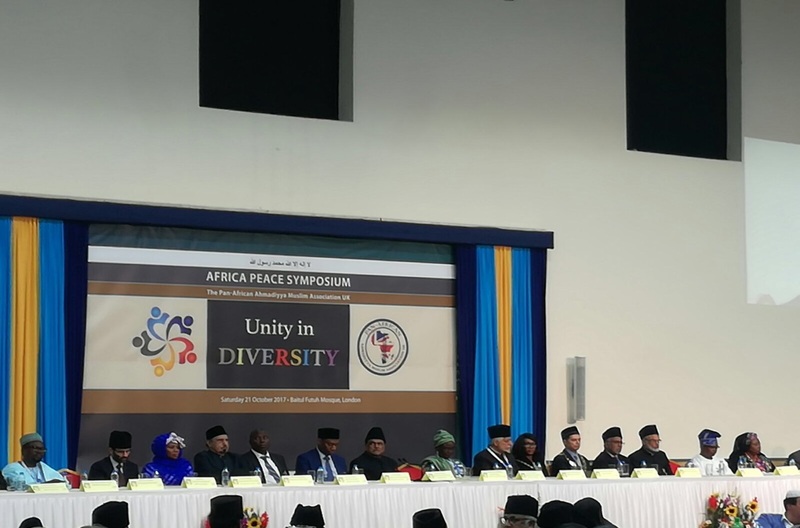 Huzur further said that the very fact that PAAMA is holding a peace Symposium is an indication that the Ahmadiyya Muslim Community is using every possible platform to try to promote peace and try to eradicate all forms of hatred and intolerance. Huzur expressed the belief that Africa, although considered by many as poor and destitute, has huge potential and great status. Huzur prayed that African leaders invest every single penny derived from Africa’s wealth for the sake of the development of their nation and should consider themselves to be servants of their nations and the guardians of Africa’s future. 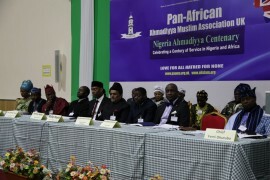 Huzur called for the spirit of brotherhood to be maintained within African nations, alongside their economic development. Huzur prayed that Allah blesses the African Continent in all respects and that Africa remains free from all forms of slavery or colonialism so that Africa becomes leader of the world Insha’Allah. 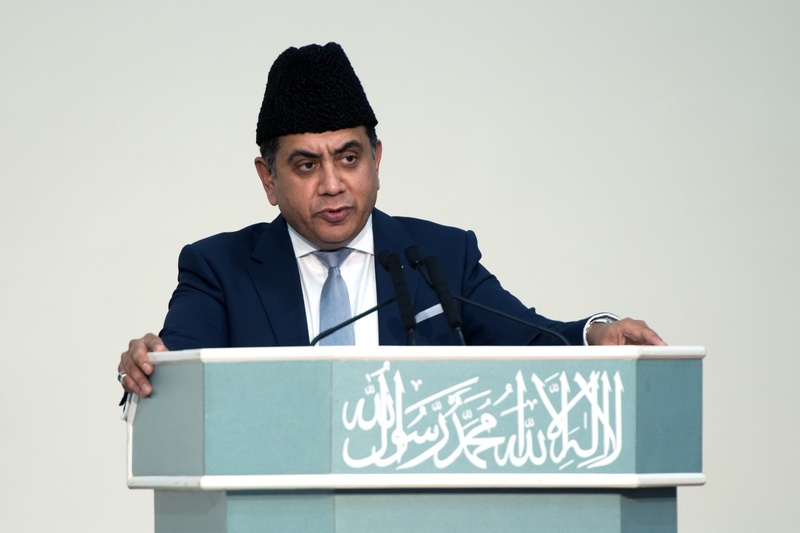 President Hayat concluded by calling on Africa and her leaders to take heed to Huzur’s important advice and thereafter called on the gathering to join him in silent prayers. Following the official closing remarks of the Symposium, dinner was served to all attendees. Overall the PAAMA UK Africa Peace Symposium was a watershed event in the history of PAAMA in various respects. 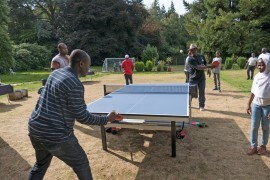 The highly distinguished list of dignitaries and guests in attendance was an indication of the appeal the event had to not only the members of PAAMA but to the rest of the British society across the board. With a recorded attendance of over 700, this was arguably one of the most successful events ever organised by PAAMA UK and the various post-event feedback received from attendees testified to that. The event was not only well attended but covered a theme which generated so much interest among not only attendees and the various speakers but also media outlets and the whole event was live-streamed by MTA International.